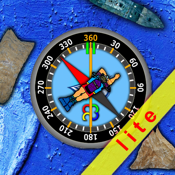 SimDive allows you to simulate a dive orientation test with the use of the compass; the purpose of the simulation is to make a dive and be able to return to the starting point of departure, only by making use of a compass. SimDive can serve both to learn how to use the compass during a navigation dive of orientation, and to keep good training practice. SimDive should NEVER be used during a real dive in water. During the simulation dive you can meet both fixed obstacles (rocks) that must be circumvented, and fish, animals, plants, shells and flotsam, that have no interaction with the diver, but which may distract him thus making it harder to return to the starting point of the dive. In order to increase the difficulties of performance, some of the conditions of immersion, such as visibility, conditions of day/night light, speed of navigation and intensity and direction of the current, may be changed. 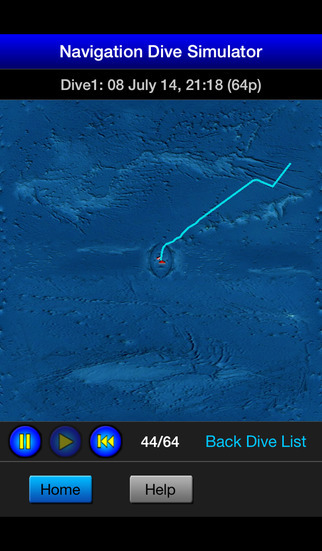 At the end of each dive, you can also keep record of the track of the dive, and recall it subsequently, to visualize and analyze the path. 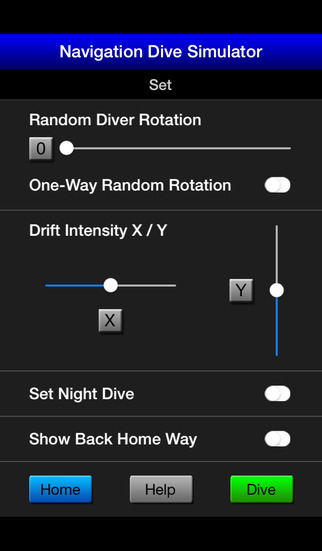 Please Note: In the LITE version some functions, such as setting the general conditions of the dive and the recording possibility, are disabled. SimDive was created by Roberto Baroncini, diving instructor of Centro Sub Faenza (Italy), with the aim to facilitate classroom teaching of the theory of navigation dive of orientation.